Diaa Bekheet | Washington, DC – American jazz bassist Ron Carter is a smart, elegant, and funky composer, who has been playing bass since 1955. In fact, Carter is considered one of the most influential bassists in the history of American jazz. Critics say he’s the world’s most prolific jazz bassist with more than 2,000 recordings under his belt. 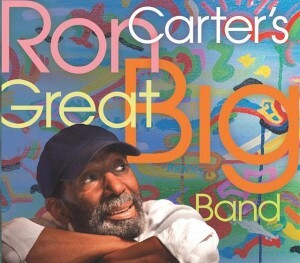 Carter’s most recent album, The Great Big Band, was recorded in June last year. Carter started playing Cello when he was 10. At the age of 17, he switched to bass. Carter says he originally wanted to be a classical musician, but got attracted to jazz when he found himself surrounded by so many jazz legends in the 1950s. He first rose to national prominence in 1963 after appearing on the album Seven Steps to Heaven with jazz icon Miles Davis and his second great quintet, which also included jazz greats Herbie Hancock, Wayne Shorter and Tony Williams. Carter also performed with a range of great musicians from Antonio Carlos Jobim, Chet Baker, Coleman Hawkins, to, Eric Dolphy, Aretha Franklin, and A Tribe Called Quest. I profiled Ron Carter on my Jazz Club USA in Arabic In 1993. He had just won a Grammy for Best Jazz Instrumental Group, for his “Miles Davis Tribute”. Carter’s long and versatile career includes teaching and lecturing. Although he recently retired as a Distinguished Professor and head of the Jazz Program at the City College of New York, he’s still on the board of directors of the Harlem Jazz Music Center. The great jazz bassist, who received two honorary doctorates and France’s premier cultural award, appears in two films about jazz music: Ron Carter & Art Farmer: Live at Sweet Basil, filmed in Sweet Basil, New York in 1990 with Art Farmer, Cedar Walton and Billy Higgins. And second is Herbie Hancock Trio: Hurricane!, a live concert of spectacular compositions and improvisations featuring an elegant and magnificent interplay between Hancock on piano, Ron Carter on bass, and Billy Cobham on the drums in 1991. Ron Carter, who just wrapped up a trip to Brazil, is now on a European tour that will take him to Hungary, France, Germany, and Poland. The jazz innovator will also perform in Japan in December. thank you a lot my dear brother. I really enjoy your jazz music blog, your news and your fantastic history. Really good, I like it. whoah this blog is wonderful i love reading your posts. Stay up the great work! You recognize, lots of people are looking around for this info, you can aid them greatly.